When the wall around their city was finally finished, the people of Jerusalem rejoiced because ‘God had given them great joy.” Nehemiah 12:43. Everyone celebrated! All the men, all the women and all of the children. And we read in the Bible that the sound of Jerusalem’s celebration could be heard far away. They were so filled with joy that they couldn’t keep quiet. And this is not unusual in the Bible – God’s people celebrated a lot! 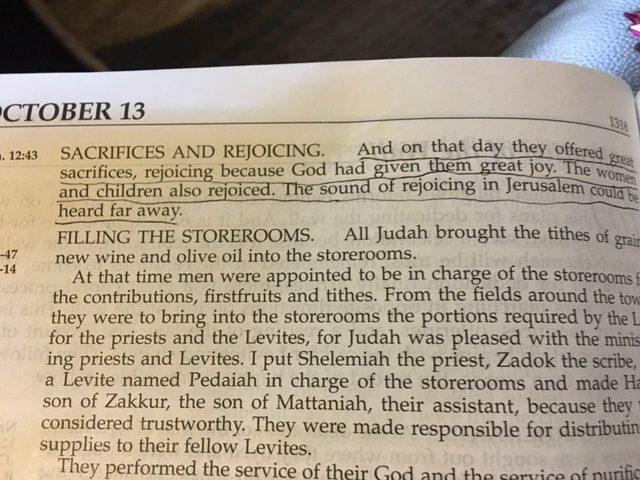 They had joy! They worshipped God! They were loud! Can you even imagine how loud it was then the heaven’s were filled with thousands of angels singing for joy and praising God? So where do we sometimes get the idea that our weekly church family celebrations and worship should be quiet? There is certainly a time and place for reverence and meditation when we get together. But there are also many reasons for joy and excitement and celebration as we worship together and are blessed. Our traditions should enhance our worship, not restrain it. Thousands of years ago, God’s people showed us how to express our joy, celebrate and worship God. Please give us joy, Abba Father!